Welcome to Monsignor Slade Catholic School! I hope this website provides the information you are seeking about our vibrant school community, our outstanding academic tradition, and the spirit that you will find when you walk through the doors at Monsignor Slade Catholic School. 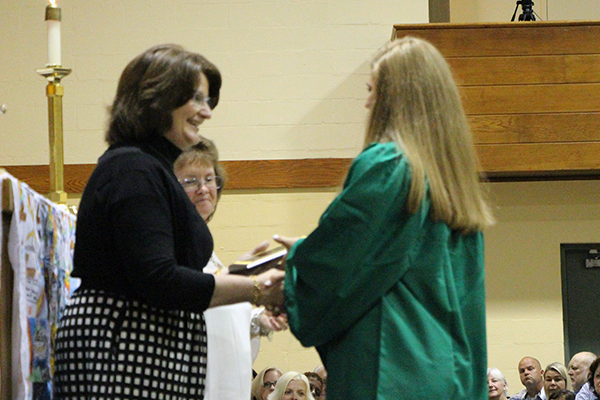 Mrs. Cox and Mrs. Slaton present a diploma to a Monsignor Slade graduate. Monsignor Slade Catholic School is an inter-parish school, serving families from four Catholic parishes within the Archdiocese of Baltimore in northern Anne Arundel County. Opening more than 60 years ago, Monsignor Slade Catholic School continues to earn its reputation for academic excellence, while serving the spiritual, developmental, emotional, and social needs of all of our children. Teachers and staff nurture the talents and gifts of each child in order to develop a comprehensive program for children from two years of age through 8th grade. Monsignor Slade Catholic School is accredited by the Southern Association of Colleges and Schools Council on Accreditation and School Improvement. Ongoing accreditation is a testimony to our school-wide commitment to continuous improvement and high educational standards. 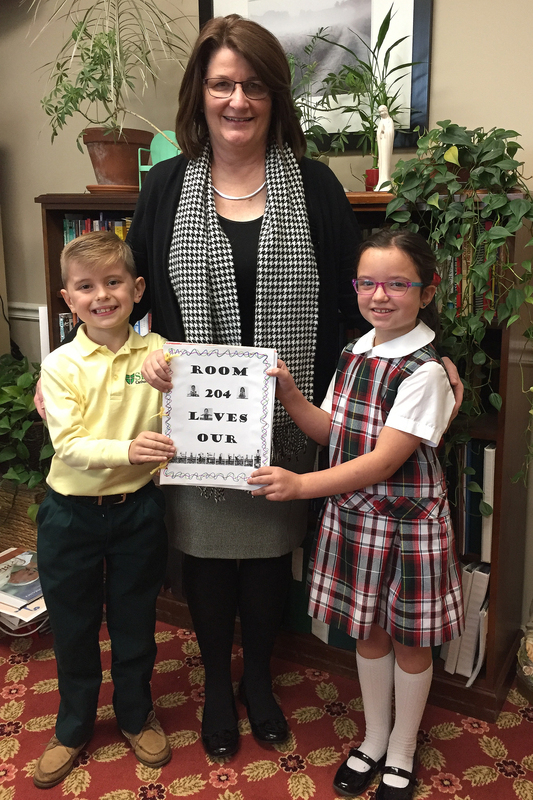 Elementary school students show appreciation for their principal, Mrs. Cox, on NCEA Principal's Day. Members of the school faculty work with families to build our community like a family; committed to the best we can achieve for all our students as they learn and grow in our Catholic school. I invite you to take some time to look at our programs here on our website and visit us at one of our open house or school events so you can truly experience Slade's spirit of welcome when you walk through the doors and take in the life and energy that fill our students, faculty, and staff. Thank you for your interest in Monsignor Slade Catholic School.